The Southern Illinois University Edwardsville Center for Science, Technology, Engineering and Mathematics (STEM) Research, Education and Outreach, the Madison County Housing Authority (MCHA), and the Mannie Jackson Center for the Humanities Foundation (MJCHF) have partnered to educate and inspire young females through STEM-related lessons. 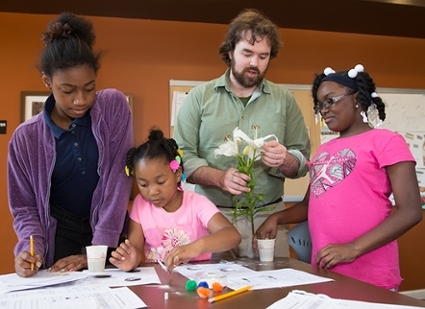 “Take a piece of foil, put it in the baking soda, and then we’re going to keep this the same test each time,” said Colin Wilson, STEM Center Resource Center Manager, to a room of approximately 20 girls in Madison, who were eager to learn more about hand pollinators. Wilson traveled throughout February, March and April to Madison and two other MCHA locations, in Venice and Alton, to teach STEM lessons to nearly 50 young girls. The lessons highlighted such topics as water pollution, filtering contaminated water, reusing greywater, agricultural engineering and hand pollinators. The goal of the partnership is to prepare young females for a bright future. The STEM Center’s high-impact community engagement practice (HICEP) complements the goals of the MCHA’s afterschool programming. “Current statistics show that 89-percent of Madison County Housing Authority family apartments have female head of households,” said Andy Hightower, executive director of the MCHA. “In an effort to decrease this percentage, we have developed programs that target young females. We feel that if the MCHA can provide young females with the tools and skills necessary to become successful women, it will have a positive impact on the community as a whole. Student feedback underscores the excitement for learning that is being generated by the STEM Center’s engaging and interactive programming. Madison County Housing Authority Mission Statement: To provide safe, quality affordable housing to low income families in Madison County; and to promote personal responsibility and self-sufficiency of residents while maintaining the fiscal integrity of the agency. Mannie Jackson Center for the Humanities Mission Statement: The MJCH conducts activities that promote mutual understanding and respect among people of different cultures, races, ethnicities, religions, and other distinctions; influence positive social change by transforming attitudes and perceptions towards greater acceptance, tolerance, and interaction among these groups; and ultimately remove barriers that hinder individuals and groups from realizing their aspirations and full potential. Photo: Colin Wilson with the SIUE STEM Center presents a lesson on hand pollinators as part of the Madison County Housing Authority’s afterschool programming. Participating in the lesson are (L-R) Malia King, Taylor Ware and Wilniah Taylor. 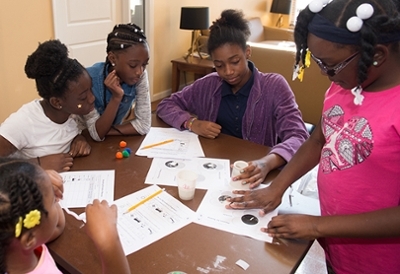 (L-R) Kalyn Belford, Army Gardner, Malia King, Wilniah Taylor and Taylor Ware work on a science project led by the SIUE STEM Center through a partnership with the Madison County Housing Authority.